Today I am going to post my “Monday Morning Commentary”. Sure, it’s Tuesday, but the whole spirit of the “Monday Morning Commentary” is that of an armchair quarterback. It doesn’t really matter when you rehash the plays and tout the victories, as long as its done before the next big game. 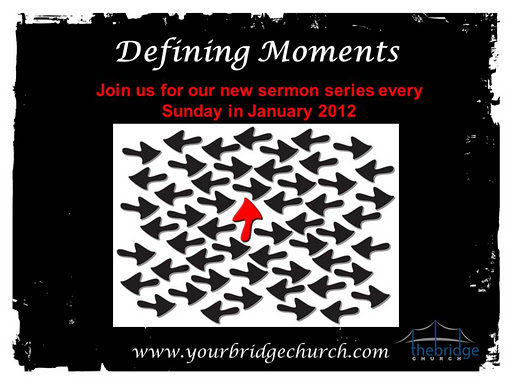 At the Bridge Church, we are in the middle of, and nearing the end, of our 2012 kickoff series “Defining Moments”. Since most of us spend at least one moment contemplating the end of one year and the beginning of the next, what better time for the church to help us outline a plan for our year? We want 2012 to include defining moments that we can look back on and know that our lives were forever altered in those moments. In the Bible we find many defining moments, most of which ended with altars to God being erected as monuments to the greatness of our God. The Bridge Church is still in it’s infancy. In fact, we don’t celebrate our 1st birthday until Sunday, May 20, 2012, but we have had many defining moments already. One thing that I want to start on my blog is a testimonial section. God has done so many things in and through people associated with and connected to the Bridge Church that it would be a shame not to shout it from my blog. We have seen healings, job miracles, financial miracles, and many salvation stories. Too often it is easy to let these moments slip by without identifying them as the defining moment that they are because we get too busy, or we chalk things up to coincidence, or we convince ourselves that we are so good and so spiritual and so full of awesome works that we deserve the miraculous. We feel that God owes us something big because we show up on Sunday mornings. We don’t want that to ever be said of the Bridge Church. We are a church that honors God and honors people and that means we celebrate the miraculous moments. We celebrate the moments that may seem like coincidences to others, but that we know to be God. I think 21st century Americans are so stinking spoiled by all the material goods and information up for immediate grabs at our fingertips that we need God to always move in the “thunder” and in the “lightening”. We have forgotten how to hear that still small voice. My personal stamp on the “Defining Moments” series is to learn to recognize when God is bringing you a defining moment. Don’t let it be drown in the noise of selfishness, pride, busyness, or covetousness. Recognize when God moves. The major themes of our series have been defining connections and defining transitions. This past Sunday we discussed “A Defining Attitude”. In an era where a bad, in your face attitude is touted as some sort of badge of honor, we, as people of God, need to give a lot of thought as to the attitude that we put on everyday. I hear a lot more “Talk to the face, not the hand” than I do “I’m sorry’s”. This sermon really spoke to me. Pastor chose two passages of scripture. One was found in the book of Daniel where we find that Daniel’s excellent attitude led to him getting promoted in the kingdom. What we fail to realize a lot of times is that Daniel lived in Babylon because his people were held captive. Even in the face of slavery and captivity, his work ethic and attitude separated him from everyone else. He then chose Psalm 40:9-10 for us to learn from David. David was a psalmist and if you have ever met any true and really good musicians and song writers, you will know that they generally are weird. True musicians, not people that just chord and sing nice, but people like Taylor Swift that write great ballads resulting from break ups and failed relationships, generally glean their work from a place of pain and oftentimes depression. David probably struggled a lot with his attitude for numerous reasons. He was the overlooked younger brother sent to the hillside to watch sheep while his better looking, stronger, older brothers were favored. David leaves for us some great words in Psalms to help us “sing” our way out of a bad attitude. The best way to be identified as someone with an “Excellent Spirit” would be to determine today that the defining attitude you want for your life is an attitude worthy of someone who has been redeemed. Actions do speak louder than words, but I guarantee you that if your words are words of praise and proclamation to Jesus, your actions will catch up to your words. Do as David said and proclaim the saving power of God. Don’t seal your mouth when good things happen. Don’t hide the goodness, righteousness, and faithfulness of God in your heart. Stop carrying a concealed weapon. We have the Holy Spirit inside of us which is the greatest tool in Spiritual warfare. Don’t conceal that weapon. Don’t hide his love and faithfulness. Proclaim them. Nothing will set your day up better for success than focusing on the goodness of God. Too often we settle for boring lives and boring Christianity. Why would anyone want to become a Christian when they see Christians with bad attitudes? Live your life out. Live a good attitude. Live bold. Live audacious, not boring. My favorite analogy Pastor used was the analogy of cappuccino versus lattes. Too many Christians are cappucino’s. They are a lot of foam and very little substance. They are asking people to pay a high price for what they have (deny yourself, take up your cross, follow Christ), but offering little in return. The Bridge Church, on the other hand, wants to be a latte. A latte still has espresso and froth, but there is a lot of substance to the cup. “Let your attitude be shaped by the faithfulness of God, not by the daily grind”.- Me. My original quote. When I wake up, I’m not going to immediately hone in on all the things going wrong and all of the lists that need completed, but first I am going to speak of His faithfulness and saving help. The goal is not to ignore your circumstances and be oblivious to the problems in your life, but to learn how to let your attitude be shaped by the promises of God. This life is just the waiting room for the auditorium of eternity. Keep it in perspective. In keeping with the Spirit of the “Armchair” Quarterback, I have to say that our Pastor has been throwing quite well.